There are so many wonderful things to be said about this incredible robot sculpture made from recycled materials, that we feel it deserves its own short documentary. 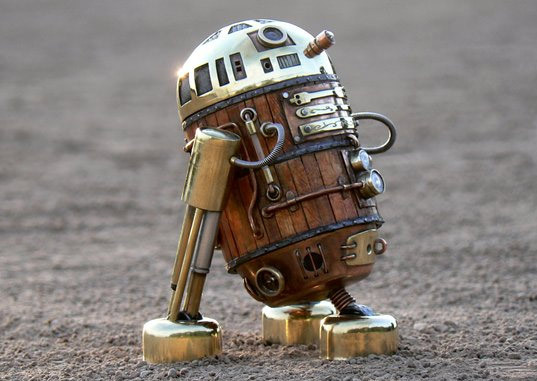 Created by UK-based artist AmoebaBoy, the R2-D2 look-alike is the spitting image of the beloved Star Wars character but with a steampunk twist. Believe it or not, the boiler planks are made from wooden coffee stirrers from a burger joint and the dome uses the internal workings of a water meter that took the artist “about two days to beat out and cut it into the shape [he] wanted.” The finished product is so spot on, we’re pretty sure even Anakin would do a double take! There are so many wonderful things to be said about this incredible robot sculpture made from recycled materials, that we feel it deserves its own short documentary. 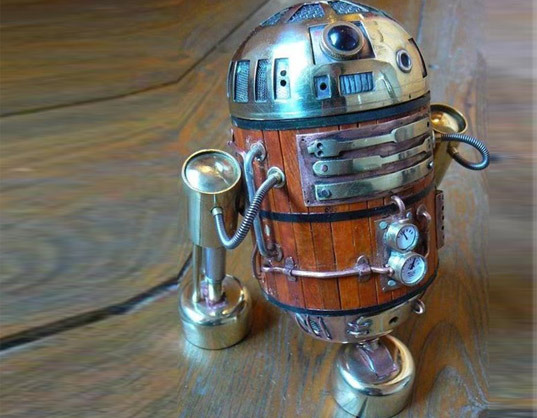 Created by UK-based artist AmoebaBoy, the R2-D2 look-alike is the spitting image of the beloved Star Wars character but with a steampunk twist. Believe it or not, the boiler planks are made from wooden coffee stirrers from a burger joint and the dome uses the internal workings of a water meter that took the artist "about two days to beat out and cut it into the shape [he] wanted." The finished product is so spot on, we're pretty sure even Anakin would do a double take!